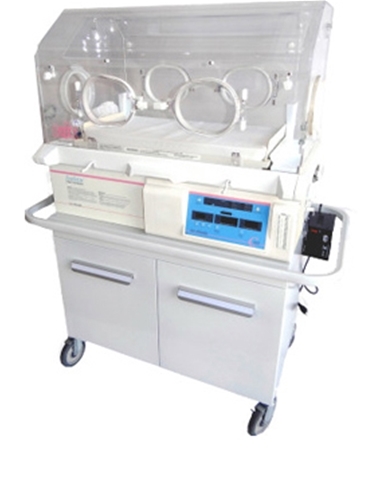 The Drager Air-Shields Isolette C450 QT infant incubator has been developed to address the unique requirements of infants. It provides thermally controlled environment required for any neonate. The Isolette C450 features both baby and air modes of operation. The important addition of the Quiet Touch (QT) helps reduce the adverse stimulation shown to have an effect on the well-being of the neonates. Oval shaped port doors for increased access. Removable microprocessor controller with keypad lock and membrane touchpad. Iris ports for ventilation tubing support Typical manufacturer's specifications and images. Quiet Touch(QT) combines proven technology with innovative features to minimize excessive stimulation to the infant while, at the same time, reducing stress to parents and attending staff. *Note: Wheels can add 3 each (6 max) to width or depth. Unit detaches from stand. Wheels: 5” diameter, Antistatic type.